Thanks SO MUCH for these two lovely patterns! I hope to try them soon! At least BEFORE winter is over! i just love this pattern. they are so easy to make. thank you! I can hardly wait to try this pattern for charity! Thanks so much for sharing this. Thank you for the pattern; I made 2 pair yesterday! I love this pattern. I am making these for all of the girls (women) in the family for Christmas. We have a new female in our family this year. 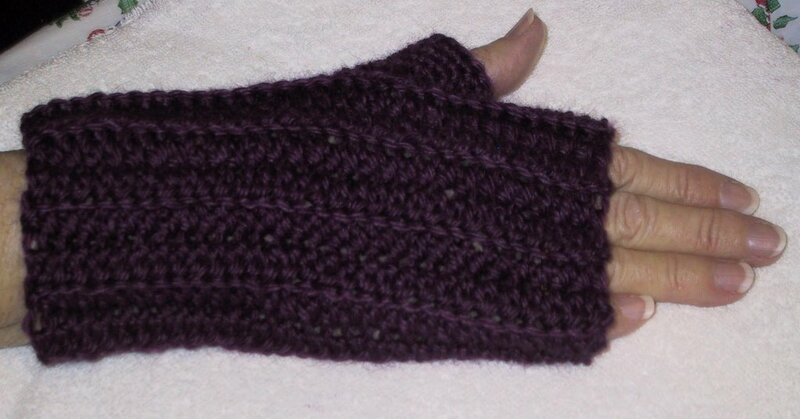 Her name is Olivia Grace and I wanted to make her a pair of fingerless gloves also. After all she is one of the girls now. I need a pattern for a baby. Can you please help me with that? You could use one of my baby mitt patterns. I'm unable to crochet right now, so no new patterns for crocheted items any time soon. It seems the pattern's text was cut off. Can you please tell us what the pattern should say after Rows 2-5 of the thumb? That's all there is. A closing ) would have made it more clear.